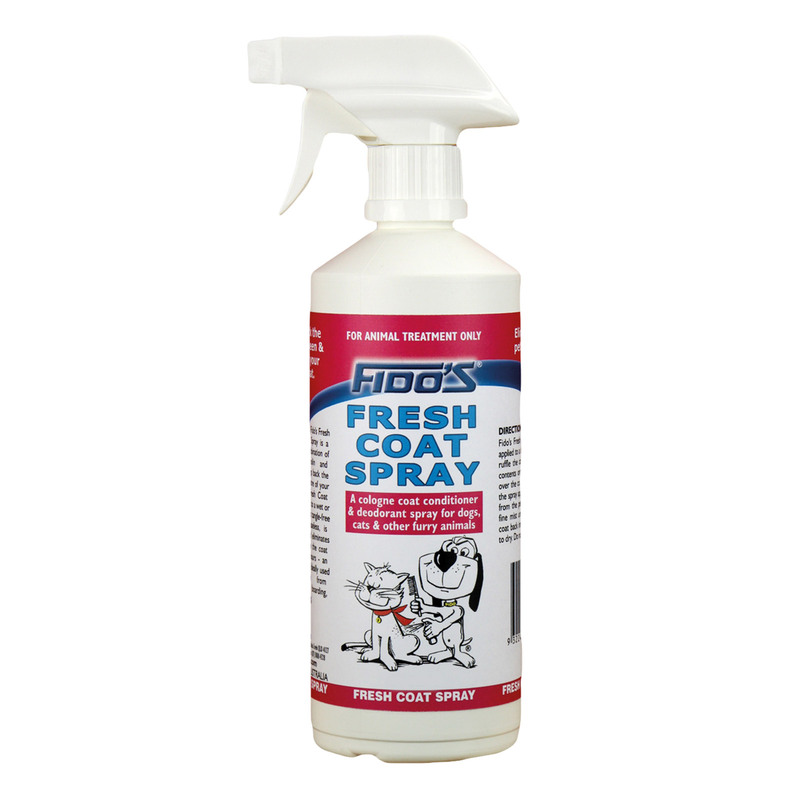 Fido’s Fresh Coat Spray is a pleasant smelling, non-greasy coat conditioner and deodorant spay for dogs. The scientifically proven cologne spray brings back the natural sheen and lustre of your dog’s coat. It assists to de-tangle coat easily and eliminates pet odours leaving refreshing smell for the day. Suitable to use on both dry and wet coat, Fido’s Fresh Coat Spray is a special pet spray for maintaining healthy coat. Fido’s Fresh Coat Spray is a combination of absorbent lanolin and silicone. This unique combination conditions and de-tangles the coat. The cologne base helps to leave the pet smelling great. It provides a finishing touch after hydrobathing. Apply to a dry or wet coat. Ruffle the coat and spray a fine mist from 25 to 30 cm until slightly damp. Brush the coat back into place and allow it to dry. Take care not to spray near cat’s eyes. A refreshing spray for conditioning coat and deodorising it. The topical formula offers mild bacteriostatic effect to protect dog skin and coat from skin problems. Fido’s Fresh Coat Spray helps to easily detangle coat through brushing. Being an effective deodorant, it eliminates pet odours and leaves the coat smelling fresh for hours. It is suitable to use with long term flea control products. Highly recommended to use on pets before discharge from hospitalisation, boarding, grooming and showing. Wear gloves while treating pet with Fido Fresh Coat Spray. No possible side effects seen. Key Ingredients Lanolin, silicone, quaternary ammonium compound. The product is really good on my fido, Titan's coat.